32 3/9 " scale (as wanted by Jonas HELLBORG). 26 frets with zero fret. 14 mm strings spacing at the Status Electro bridge (as wanted by Jonas HELLBORG himself). 8 mm at the graphite nut. 1 double action truss rod (beware as it's a typical English left screwing model). 3 bass Gotoh tuners on the bass side + 3 guitar Gotoh tuners on the treble side. Woven graphite neck with Rosewood fretboard. The semi-solid body with a single 'F' hole has a double size two-piece mahogany back with a red coloured veneer and book-matched Rosewood facing. Acoustic chambers are machined into the mahogany before the top is glued on : this allows the body to resonate and create a warmer, more "open" response. 1 Status Hyperactive humbucker really close to the bridge (as wanted by Jonas HELLBORG himself) + 1 piezo pickup under the saddle in the bridge with balance, master volume (20 detent positions), treble cut/boost for magnetic and treble cut/boost for piezo (like on all Electro II series). The Weight: 5.2 kilos . Delivered in original Status gigbag. Equipped with Thomastik JR round wound nickel strings (029 - 043 - 051 - 068 - 089 -118). Satin finish for the body and thick glossy finish for the neck. Delivered to Jonas HELLBORG in November 2001. 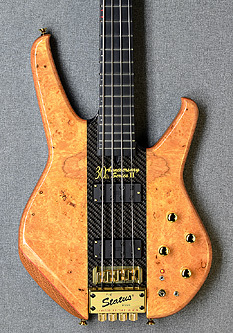 Set up by Christophe LEDUC (great french luthier). It's the rarest Status bass ever, completely original and never modified. Official price today will be more than £4500 GBP is you can get one made. The bass is located in the north of France (collection is possible in Calais, Boulogne sur mer, Lille Arras...).